Thailand or Vietnam: which country is more expensive? 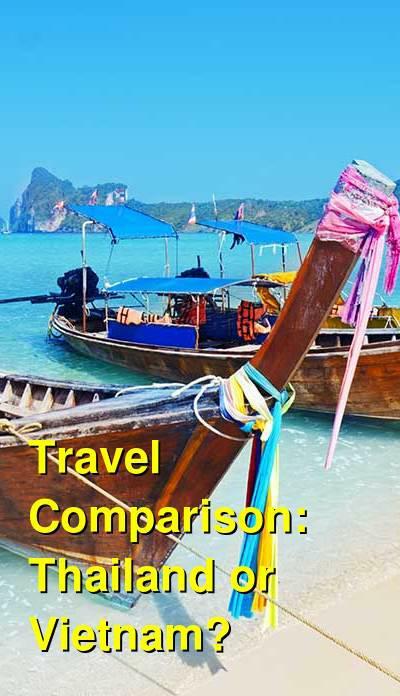 This comparison of travel costs between Vietnam and Thailand examines average prices across multiple categories. Please visit each country's individual budget page for more detailed information. Should you visit Thailand or Vietnam? Even though Thailand is the most visited country for tourists in Southeast Asia, in recent decades, tourism has surged in Vietnam. The Vietnamese government has seen the economic and cultural opportunities around tourism, and so this more traditional closed off country has opened its doors wide to welcome the influx of tourists that frequent the other nations in the region. The economic dependence on tourism can be felt in both countries, as it has in Thailand for quite some time and as tourism grows at a high rate in Vietnam. In even the most remote areas of both countries, it is possible to find hotels and restaurants that cater to foreigners. The beauty of Southeast Asia is well known around the world. The beautiful landscapes, combined with the generally friendly nature of the Southeast Asian people have led to an increasing amount of tourists to the region year over year. However, all of these visitors can have an effect on the prices of goods and services throughout both countries. Unfortunately, bartering is a must in the region, where the tourist prices are dramatically higher than local prices. So, hone your skills! The reasons to visit Vietnam are abundant, as this diverse and wonderful country offers much to do and see to travelers. While the beaches are nice, they are not as nice as in nearby Thailand or Malaysia. But the coast is not the real draw to Vietnam, as anyone who visits can tell you. The real gems are the authentic local experiences to be had in every part of the country, from floating markets in the Mekong Delta, to visiting historic temples, to trekking through the Hmong villages and fog-shrouded rice terraces in the north. And you must visit the stunning landscapes of Halong Bay, too, as this is a unique place in the world unlike any other. Vietnam offers a terrific value to tourists as costs are generally cheap, hotels and hostels are mostly modern and of quality, public transportation is cheap and efficient, the food is delicious and amazing, and the locals are friendly. While some believe that the Vietnamese can be a little pushy, just try on a smile and you'd be surprised at what happens. Likewise, Thailand has no shortage of beautiful destinations such as tropical islands, jungle paradises, and ancient ruins. 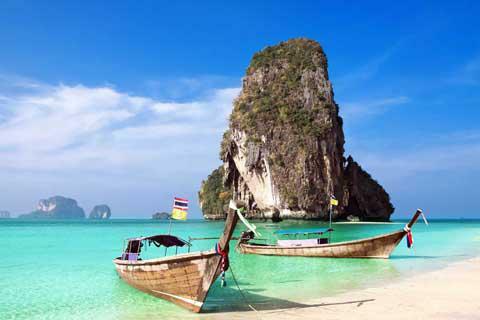 For these reasons and more, Thailand is bursting at the seams with visitors. When is the best time to visit Thailand and Vietnam? In Thailand, the high season for travel is in the "winter" months of November to February, although visitors come all year due to the year-round warm weather. The seasons are caused by monsoon winds which results in a dry season and a wet season in most parts of the country. In the north, the dry season is from November to May. The southern coasts stay relatively dry during this time as well. Due to a change in monsoon winds several times per year, the east and west coasts receive rainfall at different times throughout the year. The wet season on the west coast is usually from April to October, while the eastern coast and island experience more rain from September to December. Vietnam is warm all year, so be prepared for warmth with occasional rainfall. Vietnam does not have a best or worst time to visit, as you'll probably be visiting the entire countr which spans multiple climate areas with their own weather patterns. At higher elevations, such as in the far northwest, the weather is significantly cooler. Fortunately, some of the higher elevation towns are on the must-see list, so that should help with some of the warmer weather during your trip. In the north such as near Hanoi, summer months are warmer and have more precipitation, while winter months are dryer and cooler. In the central area, near Danang & Hue, it's dry but very hot from January into late summer (August-ish), and rainy from the summer until December. In the south around the Mekong Delta and Ho Chi Minh, it's hot and dry in winter months, and hot and wet in summer months. Other than the weather, local festivals in some cities and rural areas throughout both countries might make you want to visit, or stay away from, a particular area for a short period of time. Why is Thailand more expensive than Vietnam? Thailand's economy is strongly dependent on tourism, and this is no surprise to anyone who visits. Thailand has numerous bus and tour companies in place that cater specifically to backpackers and mid-range travelers. While this may seem like a good deal at fist, these services are significantly more expensive than the public government-run transportation system that locals use. Keep in mind that if you are simply getting a bus ticket and not a tour guide, it is generally cheaper to take public transportation instead of these tourist buses. Touristy destinations in Thailand are expensive simply due to supply and demand. On many of the islands, the flatter land is somewhat limited and therefore accommodation options are not as plentiful for the high number of tourists which visit. Also, many of the islands must have a large amount of food and supplies shipped to them, causing higher prices of food at restaurants, as well as higher taxi prices and an increase in the price of souvenirs. As a country on the rise with a growing economy and an an increase in tourism, Vietnam as a whole is still very affordable quite cheap. A large influx of tourists in recent decades has led to a rise in the tourism business, but a pro-business government has allowed competition to flourish. This has lead to a situation where prices are still fairly low due to competition. In many places, the local people have opened a small family-run hotel or a restaurant catering to travelers. Quality is sometimes inconsistent, but the options are plentiful leading to cheaper prices. Just inspect the place before you commit. What are the most expensive and cheapest cities and regions in Thailand and Vietnam? As a general rule in Thailand, the more frequently visited a destination by tourists, the higher the prices can get. And in countries where tourism is king, this is even more true, Thailand being no exception. Southern Thailand is more expensive than northern Thailand with some of the most expensive areas being the islands of Phuket, Koh Phi Phi, Koh Samui, and Koh Phangan. The time of year can also dramatically effect cost. During the Full Moon Party, prices in Koh Phangan can climb, but expenses are more reasonable during slower times. Visitors to the big metro areas of both countries can experience a mix of prices. With a more diverse range of hotels, travelers to Bangkok, Chiang Mai, Pattaya, and other urban areas can find both cheap and expensive accommodation and food options. In cities such as Hanoi, Ho Chi Minh, Da Nang, and Hue, a variety of options are available for food and accommodation, too. If you want more luxurious services and hotels, they will cost more, but plenty of cheaper businesses can also be found. In the rural areas of northern Thailand, costs tend to be cheap due to competition. Smaller towns in the north wish to attract visitors and lower their prices accordingly. However, sometimes transportation can get pricey. As Vietnam is a highly populated country, even visiting the smaller towns or the rural countryside means that plenty of hotels and restaurants are available. Smaller towns in Vietnam are still quite sizable. This means that prices are fairly consistent even in more rural areas compared to other countries. 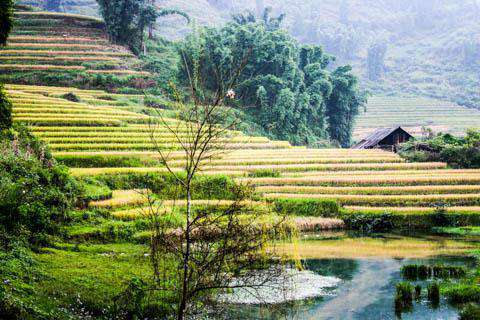 "Rural" areas in Vietnam don't have the empty feeling that they doe in nearby countries. Generally, the more touristy a destination, the higher prices tend to rise for tourist-related activities. But food and other goods usually tends to stay consistent. How you can save money when visiting Thailand and Vietnam? Negotiate, negotiate, negotiate, negotiate! When you're done, negotiate again. Vietnam is one of the most difficult countries in the world for bartering. It's even worse than Thailand, which is pretty tough as well. Hold your line, stand firm, and be prepared to walk away if you don't like the price. After that, you'll be surprised at how prices will come down just a few seconds later. Read up on negotiating strategies such as "cut their offer by a third when you counter offer, and don't pay more than half." Shop around. Don't go for the first thing you see, whether it be a small souvenir, a hotel, or an all-inclusive tour. Whatever it is that you're looking at, chances are there's another right next door. This might sound comical, but once you're there, you'll understand. Overall, if you want to save money in Southeast Asia, the rule is "go local". Eat local food, as it's not only yummy and healthy, but also very cheap. Locally owned hotels and hostels are also very cheap. Think small and your wallet will thank you - and you'll have a more authentic experience, too..